My third graders recently finished up a realistic fiction unit. This unit always poses different challenges each year. For some of my students, it is their first unit of study encouraging some imagination beyond crafty elaboration. Students are creating characters, developing problems, and working to do all of this in a way that is believable and organized. Near the middle of our unit, I was ready to really dig into how a writer organizes and builds a new idea. It began with me modeling a plan, changing my mind, restarting, and really struggling in front of them with my story elements. From there, I wrote most of my story away from students and demonstrated some elaboration techniques across two to three days as the story grew. My students were familiar with a story structure. They’ve written personal narratives their whole school lives! 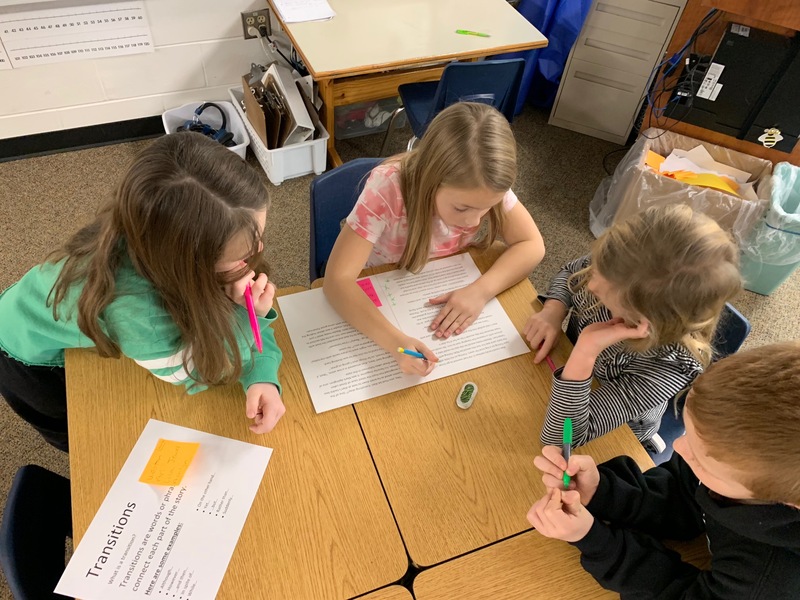 Realistic fiction isn’t that different except the ability to be so imaginative can sometimes go off the rails a bit as students begin to approximate telling a fictional story. To celebrate these approximations, I decided to have students really unpack my story and all the bits and pieces. What was present and what could we name? Would students be able to unpack their own pieces and name these same parts in their own work? Here’s a little peek at some of the work we did to really boost the understanding of one writing component: the structure of a story. First, we talked about each piece of the structure with definitions. Then students were grouped together with a job. The next day we revisited each group’s findings, combining and sharing. 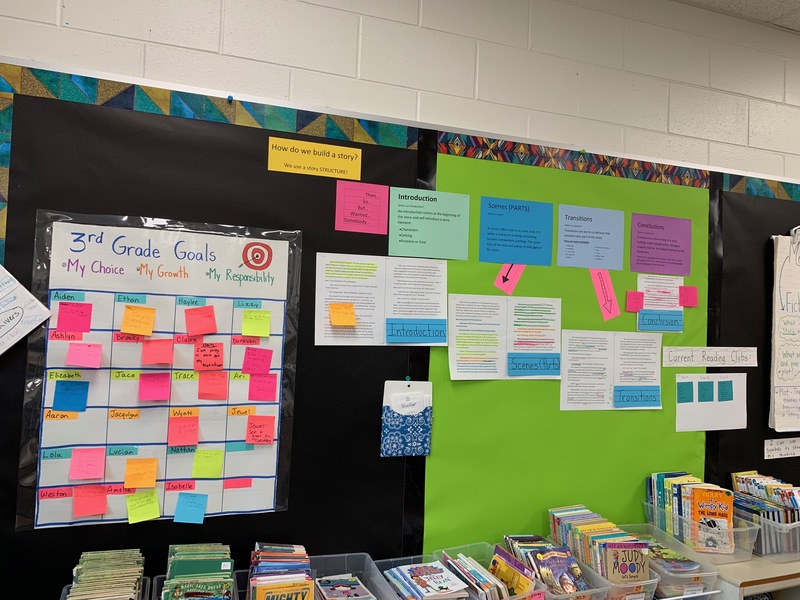 This all lived on the bulletin board for a few weeks until we wrapped up the unit allowing students to continue to revisit examples, naming the pieces of the structure in their own work, and working to improve one area at a time. This also lived within my toolkit as a reference. I could lean on this with all my students. What I found most beneficial from taking the time to really engage my students with my writing piece was listening to the conversations students had with each other. Listening to them name these components of structure and later being able to revisit the language in their own pieces. Sometimes I feel like a broken record. I assume students can re-associate words I’ve used across units and see their places in new units. 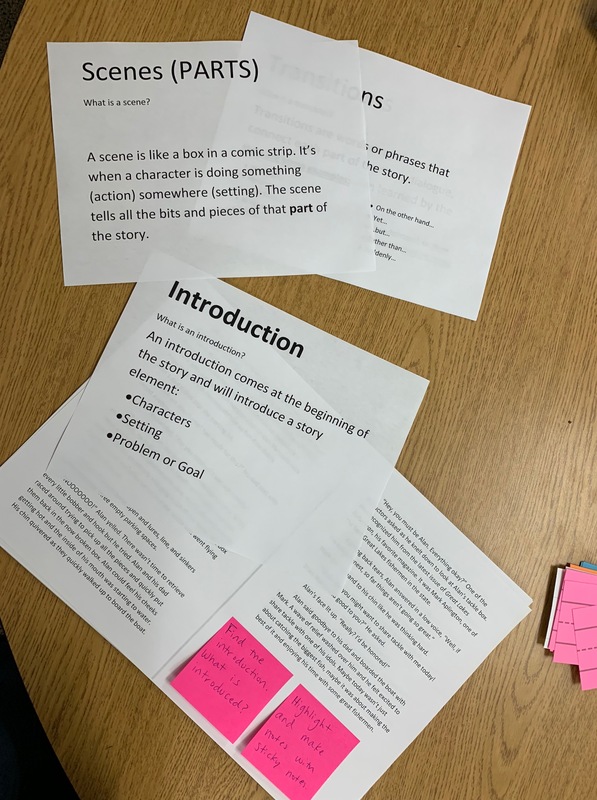 This exercise allowed me to listen in to what students really understood about where and what an introduction or a conclusion does in a fiction piece. Along with all the other components. 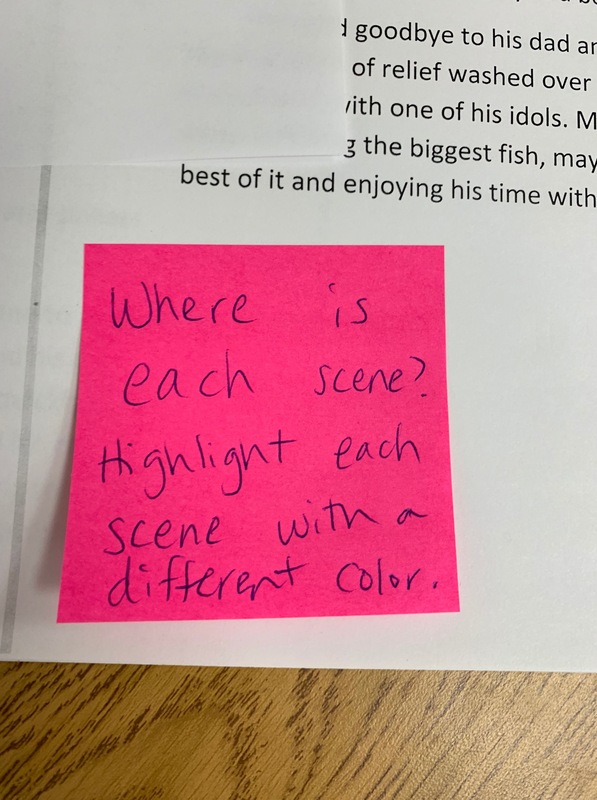 For instance, as students looked for scenes, it became clear that although we’ve talked about writing scenes, naming and finding “bits” or parts was challenging. Knowing how those parts fit together within a scene was equally challenging. As my students enter into personal expertise, constructed response, and then research writing these last three months of school I’ll be revisiting this exercise and leaning in to listen to what understandings have carried over across all of our units so far and what needs reframing. We’ll be working to stay on the rails and keep our structures strong, building as we go. 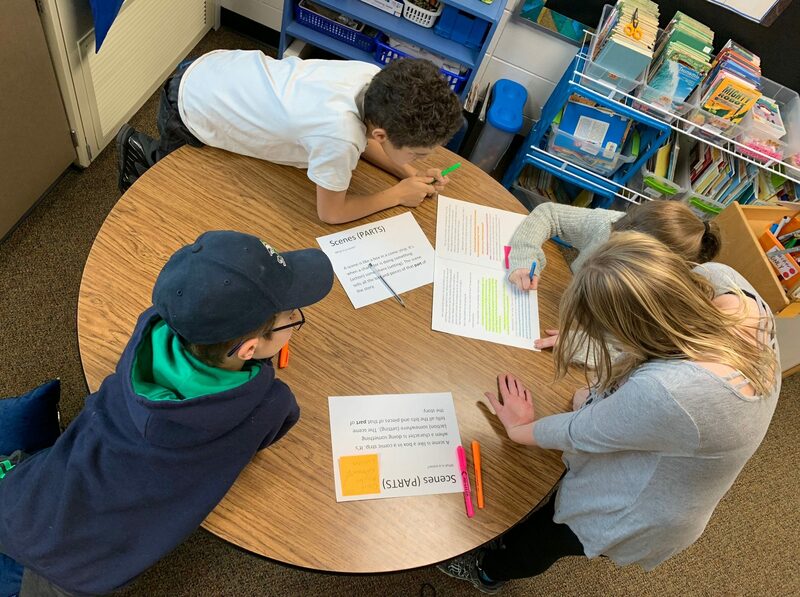 Betsy, the comment that stood out for me was “This exercise allowed me to listen in to what students really understood about where and what an introduction or a conclusion does in a fiction piece.” This in-the-moment assessment is underappreciated by school leaders. Thank you for illuminating this process for other educators. I love peeking into your third-grade classroom as much as I used to enjoy reading about your K/1 classroom. 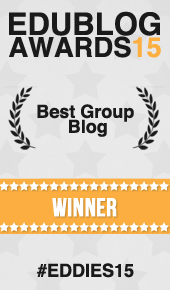 You’ve given your students excellent supports to help them as writers of realistic fiction! Just leaving this link here, https://twowritingteachers.org/2019/01/14/developing-characters/, for anyone who finds this post in the future. They go hand-in-hand!